Here is a typical textbook question. Your car has run out of petrol. With how much force do you need to push it to accelerate it to a given speed? where is acceleration, is force and is mass. This wonderfully straightforward, yet subtle law allows you to describe motion of all kinds and so it can, in theory at least, answer pretty much any question a physicist might want to ask about the world. 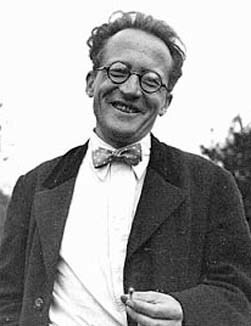 Schrödinger's equation is named after Erwin Schrödinger, 1887-1961. Or can it? When people first started considering the world at the smallest scales, for example electrons orbiting the nucleus of an atom, they realised that things get very weird indeed and that Newton's laws no longer apply. To describe this tiny world you need quantum mechanics, a theory developed at the beginning of the twentieth century. The core equation of this theory, the analogue of Newton's second law, is called Schrödinger's equation. "In classical mechanics we describe a state of a physical system using position and momentum," explains Nazim Bouatta, a theoretical physicist at the University of Cambridge. For example, if you’ve got a table full of moving billiard balls and you know the position and the momentum (that’s the mass times the velocity) of each ball at some time , then you know all there is to know about the system at that time : where everything is, where everything is going and how fast. "The kind of question we then ask is: if we know the initial conditions of a system, that is, we know the system at time what is the dynamical evolution of this system? And we use Newton’s second law for that. In quantum mechanics we ask the same question, but the answer is tricky because position and momentum are no longer the right variables to describe [the system]." The problem is that the objects quantum mechanics tries to describe don't always behave like tiny little billiard balls. Sometimes it is better to think of them as waves. "Take the example of light. Newton, apart from his work on gravity, was also interested in optics," says Bouatta. "According to Newton, light was described by particles. But then, after the work of many scientists, including the theoretical understanding provided by James Clerk Maxwell, we discovered that light was described by waves." Here is Planck's constant, an incredibly small number named after the physicist Max Planck who had already guessed this formula in 1900 in his work on black body radiation. "So we were facing the situation that sometimes the correct way of describing light was as waves and sometimes it was as particles," says Bouatta. Einstein's result linked in with the age-old endeavour, started in the 17th century by Christiaan Huygens and explored again in the 19th century by William Hamilton: to unify the physics of optics (which was all about waves) and mechanics (which was all about particles). Inspired by the schizophrenic behaviour of light the young French physicist Louis de Broglie took a dramatic step in this journey: he postulated that not only light, but also matter suffered from the so-called wave-particle duality. The tiny building blocks of matter, such as electrons, also behave like particles in some situations and like waves in others. 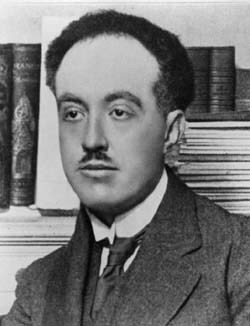 De Broglie's idea, which he announced in the 1920s, wasn't based on experimental evidence, rather it sprung from theoretical considerations inspired by Einstein's theory of relativity. But experimental evidence was soon to follow. In the late 1920s experiments involving particles scattering off a crystal confirmed the wave-like nature of electrons (see the Plus article Quantum uncertainty). 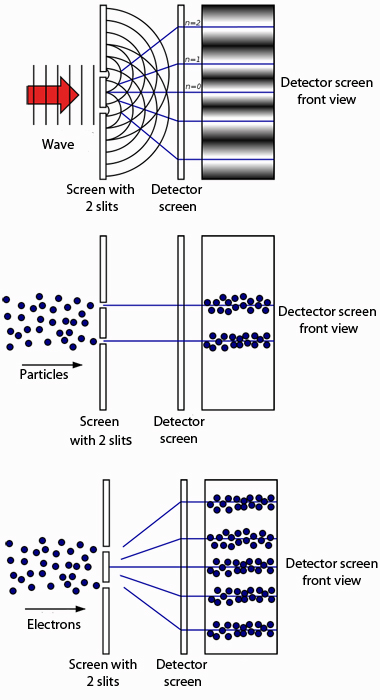 One of the most famous demonstrations of wave-particle duality is the double slit experiment. In it electrons (or other particles like photons or neutrons) are fired one at a time all over a screen containing two slits. Behind the screen there's a second one which can detect where the electrons that made it through the slits end up. If the electrons behaved like particles, then you would expect them to pile up around two straight lines behind the two slits. But what you actually see on the detector screen is an interference pattern: the pattern you would get if the electrons were waves, each wave passing through both slits at once and then interfering with itself as it spreads out again on the other side. Yet on the detector screen, the electrons are registered as arriving just as you would expect: as particles. It's a very weird result indeed but one that has been replicated many times — we simply have to accept that this is the way the world works. between the photon’s wavelength and momentum ( again is Planck’s constant). Following on from this, de Broglie postulated that the same relationship between wavelength and momentum should hold for any particle. At this point it's best to suspend your intuition about what it really means to say that a particle behaves like a wave (we'll have a look at that in the third article) and just follow through with the mathematics. In classical mechanics the evolution over time of a wave, for example a sound wave or a water wave, is described by a wave equation: a differential equation whose solution is a wave function, which gives you the shape of the wave at any time (subject to suitable boundary conditions). where is the speed of the waves. A snapshot in time of a string vibrating in the xy-plane. The wave shown here is described by the cosine function. describes a wave travelling in the positive -direction with an angular frequency , so as you would expect, it is a possible solution to the wave equation. In some situations the potential energy does not depend on time In this case we can often solve the problem by considering the simpler time-independent version of the Schrödinger equation for a function depending only on space, i.e. These equations apply to one particle moving in three dimensions, but they have counterparts describing a system with any number of particles. And rather than formulating the wave function as a function of position and time, you can also formulate it as a function of momentum and time. We'll see how to solve Schrödinger's equation for a simple example in the second article, and also that its solution is indeed similar to the mathematical equation that describes a wave. This probabilistic picture links in with a rather shocking consequence of de Broglie's formula for the wavelength and momentum of a particle, discovered by Werner Heisenberg in 1927. Heisenberg found that there is a fundamental limit to the precision to which you can measure the position and the momentum of a moving particle. The more precise you want to be about the one, the less you can say about the other. And this is not down to the quality of your measuring instrument, it is a fundamental uncertainty of nature. This result is now known as Heisenberg's uncertainty principle and it's one of the results that's often quoted to illustrate the weirdness of quantum mechanics. It means that in quantum mechanics we simply cannot talk about the location or the trajectory of a particle. "If we believe in this uncertainty picture, then we have to accept a probabilistic account [of what is happening] because we don’t have exact answers to questions like ’where is the electron at time ?’," says Bouatta. In other words, all you can expect from the mathematical representation of a quantum state, from the wave function, is that it gives you a probability. Whether or not the wave function has any physical interpretation was and still is a touchy question. "The question was, we have this wave function, but are we really thinking that there are waves propagating in space and time?" says Bouatta. "De Broglie, Schrödinger and Einstein were trying to provide a realistic account, that it's like a light wave, for example, propagating in a vacuum. But [the physicists], Wolfgang Pauli, Werner Heisenberg and Niels Bohr were against this realistic picture. For them the wave function was only a tool for computing probabilities." We'll have a closer look at the interpretation of the wave function in the third article of this series. Why should we believe this rather fantastical set-up? In this article we have presented Schrödinger's equation as if it were plucked out of thin air, but where does it actually come from? How did Schrödinger derive it? The famous physicist Richard Feynman considered this a futile question: "Where did we get that [equation] from? It's not possible to derive it from anything you know. It came out of the mind of Schrödinger." Yet, the equation has held its own in every experiment so far. "It's the most fundamental equation in quantum mechanics," says Bouatta. "It's the starting point for every quantum mechanical system we want to describe: electrons, protons, neutrons, whatever." The equation's earliest success, which was also one of Schrödinger's motivations, was to describe a phenomenon that had helped to give birth to quantum mechanics in the first place: the discrete energy spectrum of the hydrogen atom. According to Ernest Rutherford's atomic model, the frequency of radiation emitted by atoms such as hydrogen should vary continuously. Experiments showed, however, that it doesn't: the hydrogen atom only emits radiation at certain frequencies, there is a jump when the frequency changes. This discovery flew in the face of conventional wisdom, which endorsed a maxim set out by the 17th century philosopher and mathematician Gottfried Leibniz: "nature does not make jumps". In 1913 Niels Bohr came up with a new atomic model in which electrons are restricted to certain energy levels. Schrödinger applied his equation to the hydrogen atom and found that his solutions exactly reproduced the energy levels stipulated by Bohr. "This was an amazing result — and one of the first major achievement of Schrödinger's equation." says Bouatta. With countless experimental successes under its belt, Schrödinger's equation has become the established analogue of Newton's second law of motion for quantum mechanics. Now let's see Schrödinger's equation in action, using the simple example of a particle moving around in a box. We will also explore another weird consequence of the equation called quantum tunneling. But if you don't feel like doing the maths you can skip straight to the third article which explores the interpretation of the wave function. Nazim Bouatta is a Postdoctoral Fellow in Foundations of Physics at the University of Cambridge. Marianne Freiberger is Editor of Plus. She interviewed Bouatta in Cambridge in May 2012. She would also like to thank Jeremy Butterfield, a philosopher of physics at the University of Cambridge, and Tony Short, a Royal Society Research Fellow in Foundations of Quantum Physics at the University of Cambridge, for their help in writing these articles. Thanks for the interesting, and informative article. Was just browsing the web looking for a quick blurb about schrodinger and found this. Very nice setup and nice flow. Reminded me of my college days. Thank you very much for this very nice illustration, developed step by step chronically. Reading this nice article, one can see how quantum mechanics evolves and understand it better. Thank you very much. The article is really helpful !!!! 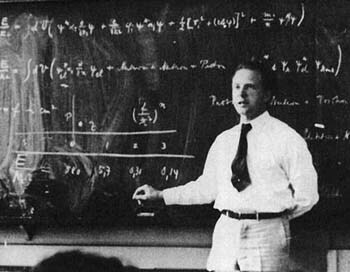 A very concise article giving a big picture description of the basic tenets of QM. Thanks. Would have been more impactful if the article was written straight instead of writing quotes from the interview. Thanks Marianne. I was looking for a straight forward explanation of Schrodinger's equation, and here is your thoughtful article. Thanks for the nice article. I just notice that the solution of the Schrodinger equation in the special case is a function of time whereas it should be a function of space only. ..I stumbled across this fantastic and superclear article! In an eye-blink I refreshed all my 35 years old knowledge! And now I am ready for a very effective lesson as a teacher able to answer the most tricky student questions. Hi I am 14 years old but I have a strong desire to become a physicist and I have so far taught my self up to general relativity.I just wanted to say this article has helped to to know even more. No we don't know everything there is to know! We know a lot about the obvious movement but the transfer of intelligence or information between the elements, (not confined to the same time), is mentioned about this. Been searching a long time for an adequate explanation of Schrodinger's equation. Thanks a million for the clarity and context. In need of some detailed explanations of the Schrodinger equation I luckily found these articles. Very nice, clear and detailed, and with much more that I could image. Thank you very much indeed. Very good introduction. Thank you. Schrodingerï¿½s time-independent equation can be solved analytically for a number of simple systems. The time-dependant equation is of the first order in time but of the second order with respect to the co-ordinates, hence it is not consistent with relativity. The solutions for bound systems give three quantum numbers, corresponding to three co-ordinates, and an approximate relativistic correction is possible by including fourth spin quantum number.